Large quantum computers are expected to drastically change the crypto and cyber world. There are tens of practical suggestions for building quantum computers (QC), but only two succeeded to go beyond a few, say 2-7, quantum bits (qubits): Superconducting QC and ion-trap QC. The ion trap QC model and implementation have led to a Wolf Award to Cirac and Zoller in 2013 and to a Nobel Prize to David Wineland in 2012. Prof. Hensinger is among the world leaders in the ion trap QC community, and in his talk he will present several new directions to make ion trap QC scalable. Abstract: Quantum computers may be able to solve certain problems that are so complicated that even the fastest supercomputer would take millions of years to provide an answer. Entanglement and superposition are quantum phenomena which can be tamed in order to build such a machine. 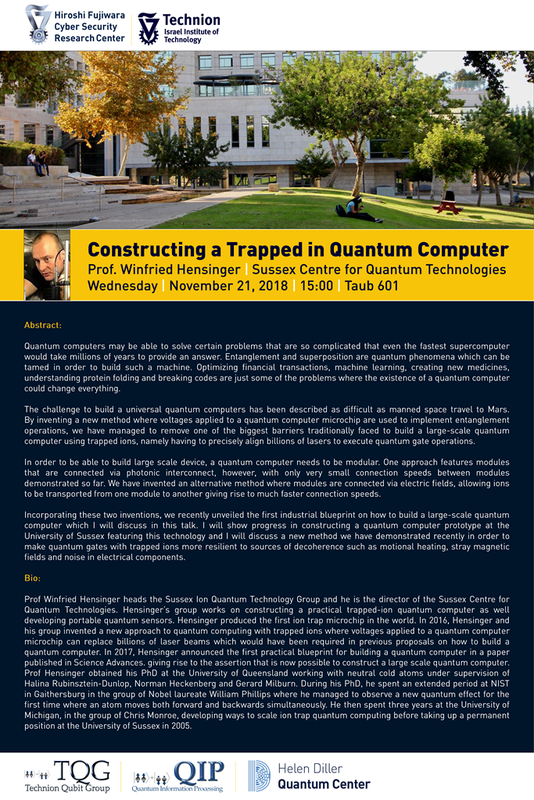 Optimizing financial transactions, machine learning, creating new medicines, understanding protein folding and breaking codes are just some of the problems where the existence of a quantum computer could change everything. The challenge to build a universal quantum computers has been described as difficult as manned space travel to Mars. By inventing a new method where voltages applied to a quantum computer microchip are used to implement entanglement operations, we have managed to remove one of the biggest barriers traditionally faced to build a large-scale quantum computer using trapped ions, namely having to precisely align billions of lasers to execute quantum gate operations. In order to be able to build large scale device, a quantum computer needs to be modular. One approach features modules that are connected via photonic interconnect, however, with only very small connection speeds between modules demonstrated so far. We have invented an alternative method where modules are connected via electric fields, allowing ions to be transported from one module to another giving rise to much faster connection speeds. Incorporating these two inventions, we recently unveiled the first industrial blueprint on how to build a large-scale quantum computer which I will discuss in this talk. I will show progress in constructing a quantum computer prototype at the University of Sussex featuring this technology and I will discuss a new method we have demonstrated recently in order to make quantum gates with trapped ions more resilient to sources of decoherence such as motional heating, stray magnetic fields and noise in electrical components. (http://advances.sciencemag.org/content/3/2/e1601540.full) giving rise to the assertion that is now possible to construct a large scale quantum computer. Prof Hensinger obtained his PhD at the University of Queensland working with neutral cold atoms under supervision of Halina Rubinsztein-Dunlop, Norman Heckenberg and Gerard Milburn. During his PhD, he spent an extended period at NIST in Gaithersburg in the group of Nobel laureate William Phillips where he managed to observe a new quantum effect for the first time where an atom moves both forward and backwards simultaneously. He then spent three years at the University of Michigan, in the group of Chris Monroe, developing ways to scale ion trap quantum computing before taking up a permanent position at the University of Sussex in 2005.